One of the reasons Indianapolis Flooring store, Kermans, has designers on our showroom floor is because we understand that many clients need help choosing the best flooring for their home. We help a wide range of customers - people who know exactly what they want to people who haven't even decided between carpet or hardwood. People who want to put flooring in one room of their home to people who are building a new home and need flooring for the entire house. People who are shopping on a budget to people who are ready to invest in luxury flooring. We have ideas and products for all of these needs. Over time, we notice that we're having a lot of the same discussions day after day. That's when we spot a trend in Indianapolis flooring. What are the flooring trends we've noticed lately? Let's talk about two popular flooring trends in the Indianapolis market right now and share a few ways you can make the most of them in your home. Grey is a hot color in interior design right now and flooring is no exception. Grey is a color that's a natural for a floor. It is available in all types of flooring - tile, carpet, hardwood, area rugs - and it can act as a neutral or design accent depending on the shade and use. What are some ways homeowners are using grey floors? Wide-planked hardwood: Grey wood lends a weathered appearance to a room that can be a perfect accent for a beach or country themed design. When used in a less rustic, more high gloss wood it is also very contemporary. Grey woods are popular in any species and laminate flooring as well. Glass tile accents: Small, grey tiles make beautiful accents in nearly any color of flooring or tile backsplash. This is a more subtle way to introduce grey into a design but a fun one. Marblelized tile: While marble itself may be out of the price range for most homeowners, marbelized tile (usually ceramic tile made to look like marble) is becoming very popular. Available in a wide range of tile sizes, this is a classic way to bring grey into your home. Patterned carpets or rugs: Patterned carpets are a trend all their own this year - a patterned carpet in grey is the perfect way to add a modern, sophisticated look to a room. And if you find the perfect carpet for your room but don't want to use it wall-to-wall, Kermans can create a custom area rug for you. Yes, we said vinyl flooring. "This is nothing like the vinyl that you remember from your kitchen growing up," notes Kermans design consultant Nichole Hansen. "This is vinyl cleverly disguising itself as stone or wood flooring. 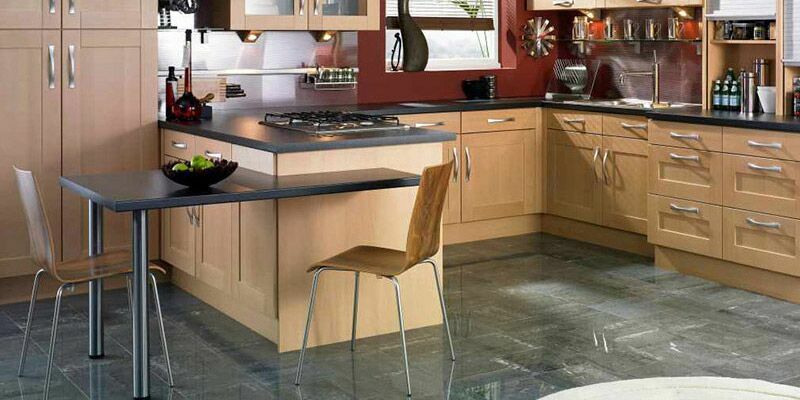 It brings all the maintenance ease of vinyl with the appearance of a much more expensive floor. It's very popular right now." This example of Armstrong's luxury vinyl collection is available at Kermans Flooring Store in Indianapolis. We're excited to share these Indianapolis flooring trends with the people who come through our doors. Stop by our showroom on the northside of Indianapolis and ask how these flooring options might fit in your home. Better yet, make an appointment ahead of time - it's free - and our design consultants will have suggestions ready for you to review when you arrive.